A wave of residents have written in support of plans to build a water sports teaching facility and café on Littlehampton seafront. Supporters of former world champion windsurfer Jamie Hawkins’ plans to demolish the Sea Road shelter and replace it with a two-storey building outstripped objectors by nearly five to one on Friday. 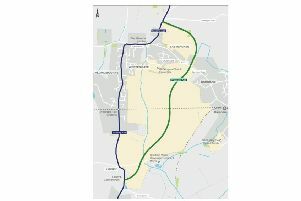 Littlehampton Town Council’s planning and transportation committee had objected to the plans when it met last month – but a final decision will be made by Arun District Council. Digital images of the proposal were released this week by Mr Hawkins. He said: “I have been fortunate over the years, being able to develop myself as a windsurfer and managed to achieve three windsurfing world championship titles. Residents in favour of the scheme hailed the plans as a ‘fantastic opportunity’ for the area. But others questioned whether the town needed another café and raised concern over the scale of the proposed building. Littlehampton Civic Society said it welcomed imaginative applications which safeguarded the seafront’s ‘unique open seafront’ while boosting tourism. It lodged a ‘conditional’ objection to the plans, however, calling for more information on the opportunities to ‘better integrate the three main water sport activities in the area’. Mr Hawkins said he would invest around £500,000 into the venture, creating ten full-time jobs and 12 part-time roles. Toilet facilities, showers for water sports enthusiasts, cycle racks and counter for kite surfing and paddle boarding lessons were also part of the plans.